John Lanchester brings to light a new theory in his book I.O.U. : it all started with the fall of the Berlin Wall. Read about how here. What do you remember about 2008? Usain Bolt stunning and showboating at the Beijing Olympics? The election of Barack Obama? The war between Russia and Georgia? It was quite a news year, yet it’s likely nothing has had a bigger impact on you than the beginning of the financial crisis, whose effects ripples into today. Called the worst crisis since The Great Depression, the tumultuous situation in Greece and the continuing trials and tribulations of the wider European economy are testament to the fact that even seven years later, what began on American soil in 2008 has taken its toll on the world. Just why it all happened in the first place is a favorite topic at work functions and luncheons, and you’ve probably heard every theory out there – except for this one. In his book I.O.U, award-winning journalist and novelist, John Lanchester, pins the blame on the fall of the Berlin Wall. Come delve deeper into his theory to make sure you’re the one with the most insightful comments next time the subject comes up. Late in the Cold War, the US and the Soviet Union represented two polar-opposite economic systems, Capitalism and Communism. And guess what? This contrast benefited the US. After all, the whole debacle was something of a beauty contest between the two systems, both striving to prove they could create better lives for their citizens. The democratic government in charge of the USA bent over backwards to make plain the benefits of their capitalist system: free education, steady growth in incomes, and a robust welfare system. Under such first-date, honeymoon conditions, the middle and lower classes, normally hindered by the free market, didn’t have it so bad. The beauty contest came to an abrupt end with the fall of the Wall in 1989 and the dissolution of the Soviet Union in 1991. And unlike a pageant, it wasn’t necessarily good for the victors. Lanchester argues in I.O.U that, free of the constraints of the contest, the capitalists in charge of the USA stopped caring for the poor and dispossessed. After all, there was little political incentive to limit inequality. Since 1980, the wealth of the 1% has rocketed up 700% while, for the other 99%, income has stayed relatively the same. 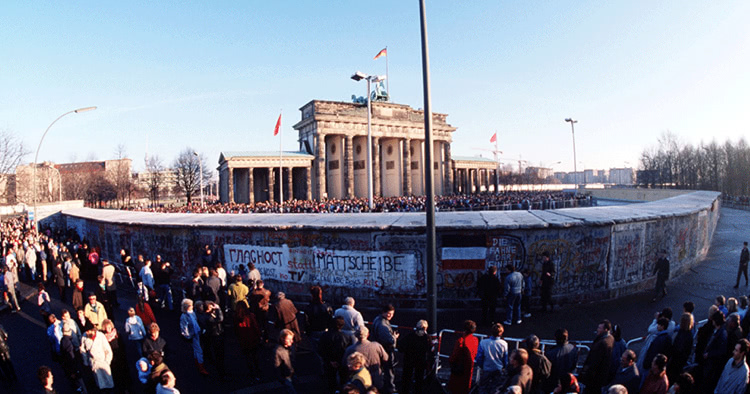 The inequality spurred by the fall of the Berlin Wall left lasting effects which led to 2008’s financial downturn. The lesson here? Sometimes it pays to look a bit farther back into the past to find the causes of serious problems. Whether on a comparatively smaller professional scale, or when you’re talking biggies like the world economy, performing a candid autopsy of the situation can help get to the bottom of the deepest structural issues. And even if your professional situation is ticking along nicely, you’ve got a new pet theory for your next business lunch. The faltering world economy continues to be the dinner party topic du jour. Time to get reading John Lanchester’s I.O.U for a deeper look into why it crashed, and why nobody saw it coming. And if you’re lacking time, a read through the book’s key insights on Blinkist will only take you 15 minutes.